Now you can make 1 basic dough and turn it into 16+ kinds of delicious, nourishing, and uniquely different cookies. How fun is that!? The Basic Dough recipe makes enough for either 2 different kinds of cookies (1 rounded cup of each), or 1 doubled kind of cookie (2 rounded cups). One of my favorite things to do? Double the Basic Dough recipe, divide the dough into 4 rounded 1-cup portions, and make 4 different kinds of cookies from 1 bowl of dough! A cookie for every craving! My favorites at the moment are Triple Ginger Cookies, Czechoslovakian Cookies (with strawberry jam and a pinch of cardamom), Double Chocolate Peppermint Cookies, and the Lavender Cookies… if I had to pick just a few. How about turning it into a gift for your favorite food-sensitive (or not) friend? Combine the Basic Dough dry ingredients in a pretty glass jar (pint size works without add-ins) and include a recipe card with a few of the cookie recipes listed below. 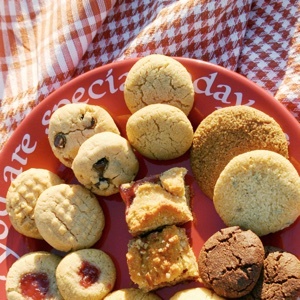 If the cookie you'd like to gift includes dry add-ins, include them with the dry ingredients in a larger jar. What a beautiful, thoughtful, and tasty way to share a little love! This recipe is Paleo, gluten-free, grain-free, dairy-free, refined sugar-free, and even egg-free (if necessary)... but FULL of taste! Makes about 2-1/4 cups of dough and about 30 2-1/2 inch cookies. In another medium-sized bowl, whisk together the wet ingredients. Consider reducing the honey amount to 1/3 cup (per full batch) for a slightly less sweet cookie. Combine the wet ingredients with the dry and stir well. 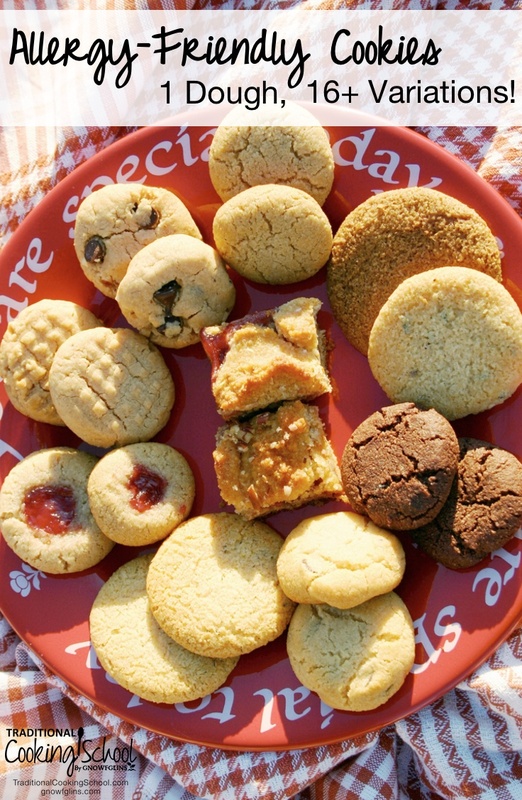 Choose cookie type(s) (see below) and decide if making 2 half-batches or 1 full. Pop in the fridge for about 1 hour (if you'd like to make less messy roll-and-press cookies). Note that cookies with butter need to chill a little longer than cookies with coconut oil if you'd like to make them into roll cookies. If you are making drop cookies, forgo refrigeration altogether. Preheat oven to 350 degrees Fahrenheit and place an oven rack in the center of the oven. Scoop out 1 tablespoon-sized portions of dough and roll into a ball or drop onto the cookie sheet. For rolled cookies, use your finger to gently press them down to 1/2 inch thick. Bake for 9 to 11 minutes. I find 10 minutes is the sweet spot for my oven and palate. Allow to rest on the cookie sheet a bit before removing them to a cooling rack. These cookies store beautifully in the refrigerator or freezer. The freezer, while keeping them conveniently out of sight and out of mind, won't keep them too hard to enjoy with a hot cup of tea. If cookies aren't quite your thing, drop dough into regular or mini muffin tins to make a delicious bar type cookie! Pat down the dough or roll first for a less rustic look. Adjust cooking times as necessary. For some fun crystal crunch, roll dough balls in sugar of choice. Or if you prefer a nutty flavor, roll/press dough balls into crushed crispy nuts of choice. For a full batch of Molasses Spice Cookies or Triple Ginger Cookies (or a combined half batch of each), I recommend using 1/4 cup molasses and 1/4 cup honey in place of the 1/2 cup honey. One of my favorites with strawberry jam and a pinch of cardamom. A delicious treat any time of day! If using full batch of Basic Dough, grease 8x8-inch pan or line with parchment paper and lightly brush with oil. A full-size loaf pan works nicely if using 1/2 batch of dough, but make sure to halve other ingredients too. The jam contributes to the sweetness of this cookie, so consider decreasing the honey in the Basic Dough recipe to between 1/4 or 1/3 cup. Drop 1/2 of mixture by spoonfuls into bottom of the prepared baking dish. Chill and then spread to completely cover bottom of pan. Drop remaining dough by spoonfuls over the jam. Bake at 350 degrees Fahrenheit for 25 to 30 minutes. Cover with parchment paper after 20 minutes to prevent excess browning. **Try stirring coconut into the bottom half of dough and crushed crispy nuts into the top half. Yum! Add ingredients to Basic Dough. Form into cookies and bake, as described in Basic Dough (recipe above). For a full batch of Molasses Spice Cookies, I recommend using 1/4 cup molasses and 1/4 cup raw honey in place of the 1/2 cup molasses. Ah, cardamon. 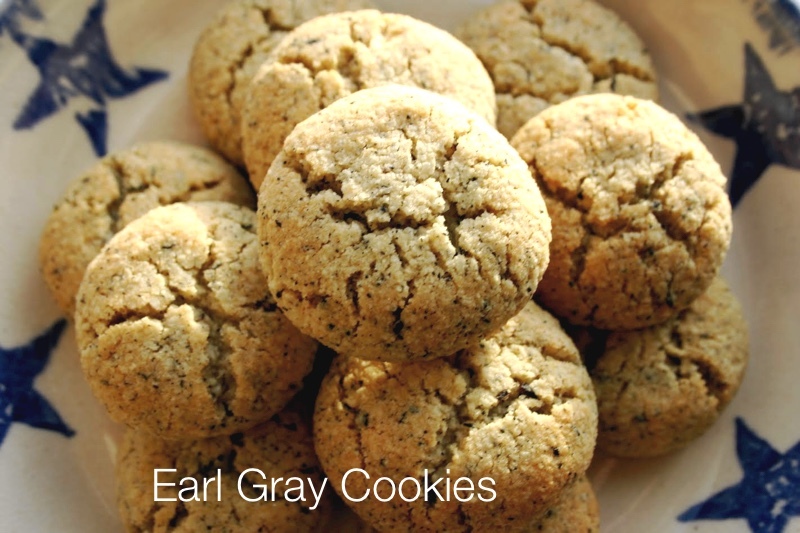 Citrusy, minty, spicy, and herbal all at the same, so delicious in a cookie! Oh, mercy! The combination of lavender and lemon makes this one of my favorites. Thyme in a cookie? Yes! Allergy-friendly chocolate chip cookies, a classic treat! *An extra pinch of sea salt (on top of what is in the Basic Dough) really sets off the chocolate flavor. **Or these no-sugar, stevia-sweetened chocolate chips. Did someone say chocolate? Double the chocolate-y goodness in this treat! *Or these no-sugar, stevia-sweetened chocolate chips. Is there anything that can replace a fresh, homemade Snickerdoodle warm out of the oven? Stir vanilla and cream of tartar into the Basic Dough. Roll dough into balls and then roll the dough balls into cinnamon-sugar mixture. Place on a cookie sheet and follow baking directions in Basic Dough (recipe above). 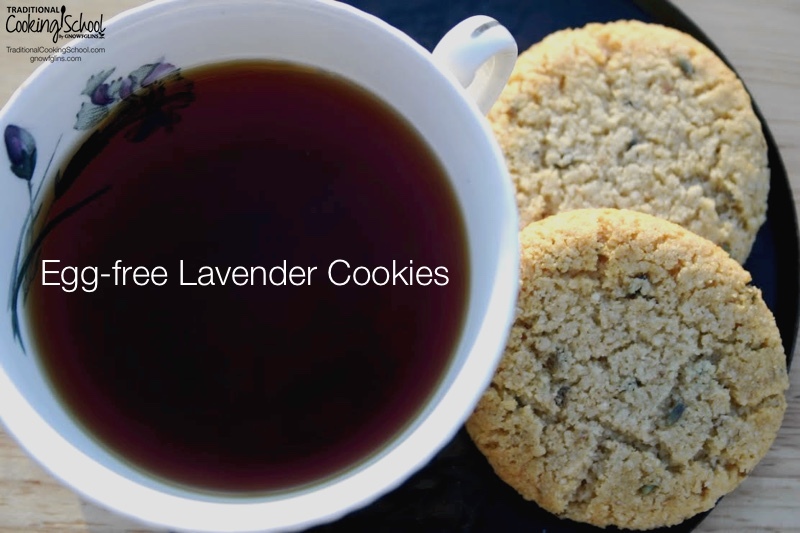 Blueberry Lemon Green Tea gives this cookie a unique, and delicious, flavor. Grind tea with mortar and pestle or whiz in a spice (or coffee) grinder until broken down but not quite a powder. Stir into Basic Dough along with the vanilla and lemon juice or zest. Follow baking directions in Basic Dough (recipe above). Peppermint and chocolate, a winning combination! Add peppermint essential oil to Double Chocolate Chip dough. Bake as described in Basic Dough (recipe above). This tasty cookie is a great way to use dried cranberries! Add vanilla extract and optional coconut or crushed nuts to Basic Dough. Roll into balls and use thumb, small dowel, or the end of a wooden spoon to make a small indentation in the center of the ball. Fill each dip with about 1/4 teaspoon jam. Use your favorite nutbutter in this delicious cookie. Scoop out 1 tablespoon-sized portions of dough and roll into a ball. Press a criss-cross pattern into each dough ball with a fork to flatten slightly. *An extra pinch of sea salt (on top of what is in the Basic Dough) really sets off the flavor. Love ginger? These cookies have a wonderful zing to them. For a full batch of Triple Ginger Cookies, I recommend using 1 tablespoon molasses and 1 tablespoon raw honey in place of the 2 tablespoons molasses. Fan of Earl Grey? You must try these delicious cookies! Stir into Basic Dough along with the vanilla extract. What sounds good to you? 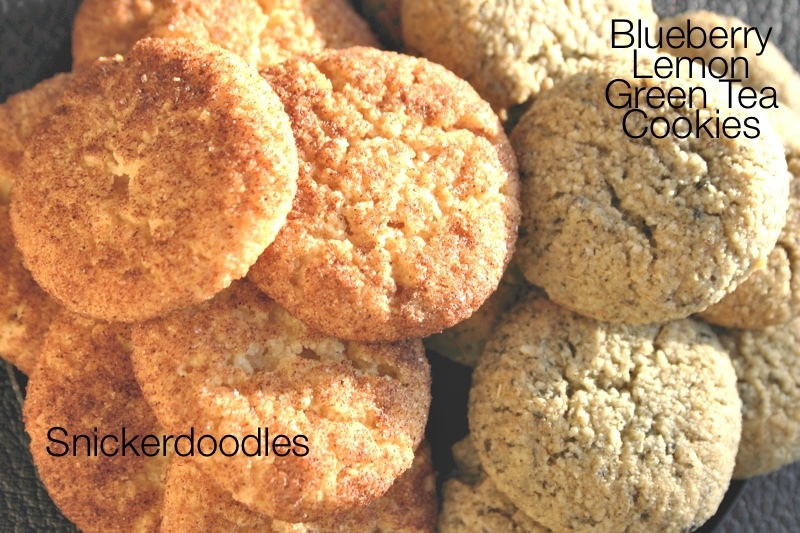 The possibilities are endless with these tasty allergy-friendly cookies! been so far? So no sourdough recipe this time?? So glad to see you did another post. How about a picture of your boys next time? Hope all is well with you. Blessings. How would I freeze this recipe? In separate dough balls before mix ins? Or after mix ins and in their cookie shapes ready to go? Thanks! These look amazing! Hi Jen~ Make the cookies and freeze them on a cookie sheet as rolled cookies or pressed cookies. Pop them in a bag after they are completely frozen for ready to bake cookies! These look awesome, but is there an alternative to almond flour for those with tree nut allergies? Would chickpea flour work? How about sunflower seed flour. When we could do nuts it subbed well for us in recipes. Just be careful as things can turn a shade of green due to baking soda or powder, I don’t remember which. Didn’t change the taste, just a tinge of green. Thanks for the suggestion – I love sunflower seeds (and can eat them 🙂 ). I don’t think my kids would be too fazed by green tinges LOL. Could I grind some sunflower seeds myself if I can’t find the flour, or would it turn into “butter”? about almond flour….can you get sprouted almond flour…otherwise wouldn’t this contain the enzymes that are bad for the gut? I’ve always wondered about that, for gf recipes that call for nut and seed flours? Sara~ It is always best to use nuts and seeds that have been properly prepared. Feel free to whip up your own batch of almond flour. I’m not sure what is out there as far as sprouted or soaked first nut/seed flours. Let me know if you find anything! I was under the assumption that if the almond flour is from blanched almonds, it’s okay, since the anti-nutrients are primarily in the skin. Is this incorrect? If so, please let me know, as I will want to cut back on our use of almond flour. Thank you Erin for sharing such an abundance of cookie joy! Huda~ Maybe cut the recipe in half and experiment with your current GF flour blend? Worth a try! Hi there I thought you said eggless recipe but you added eggs! But looks good thank you for the recipe. Hi Anali~ I did give a substitution, if needed, next to the 1 egg on the list of ingredients. Feel free to use 1 Tbs. ground flax mixed with 3 Tbs. water. Enjoy! What can be used in place of almond flour besides sunflower seed flour (another allergy)?